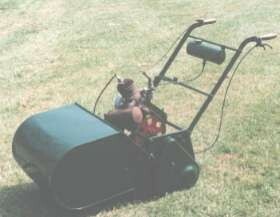 Qualcast's Sixteen was the first motor mower made by the company. It was introduced in the late 1930s, just before the start of World War II, although only a few of these early machines survive. The bulk of production was during the late 1940s and early 1950s when the Qualcast Sixteen was popular with domestic gardeners who wanted an inexpensive but reliable motor mower to cut their lawns. The design of the Sixteen was very simple, with two cast iron side frame plates supporting the drive shafts, engine mounts, rear and front rollers and cutting assembly. This made the mower less expensive than many contemporary machines. The mower was available in a single cutting width of 16" (hence the name) with a Villiers 95cc Midget two stroke engine. Early examples had the fuel tank mounted between the handle bars but the design was soon changed so that the tank was mounted above the engine on special brackets. The engine was essentially the same on all models, although early examples are mounted with a slight forward lean whereas later versions were mounted in an upright position. Unlike many other mowers of the same era, which had either kick or rope pull starting mechanism, the Sixteen was started with an old fashioned detachable handle that was engaged in a shaft running across the frame underneath the engine. The transmission on early models had separate chains to drive the rear roller and cutting cylinder, each engaged by a dual plate clutch hidden with the chains under a cover on the side of the mower's frame. This arrangement meant that the cutter was rotating whenever the engine was running. Later models had one drive chain that engaged the rear roller and cutting cylinder through a single plate clutch operated by a lever on the handle. On these machines the engine could be started more easily and the cutter and roller then engaged for mowing when the operator was ready. 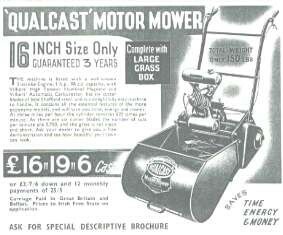 Production of the Qualcast Sixteen continued into the 1950s although the mower was eventually superseded by compact machines with more reliable and powerful engines. It is nonetheless one of the classic British motor mowers.